Figure 2.3 from The doTERRA Essential Chemistry Handbook, Edited by Dr. David K. Hill, D.C. Essential oils are naturally occurring aromatic compounds produced by various parts of the plant, such as the leaves, stems, flowers, fruit/berries, seeds, roots, wood, resin. Essential oils get their aroma or scent from these aromatic compounds. Some essential oils are made up of primarily one main chemical ingredient or component. While other essential oils are made up of hundreds, even thousands of chemical components. Many factors play a role in determining the chemical makeup of an essential oil. The conditions of the soil, with regards to nutrients, irrigation, and toxicity play a role. The weather condition (i.e. hot/cold, dry/humid, amount of rainfall, etc) also factor in to the therapeutic component profile that the essential oil will produce. The season of year and even the time of day that the plant material is harvested can have an effect on the chemical components that will be present in the essential oil. 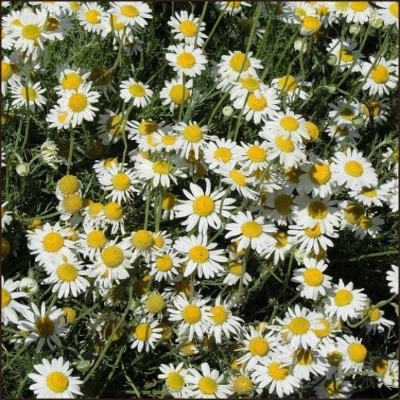 The chemical ingredients in the essential oil are what give the essential oil its therapeutic efficacy. When we familiarize ourselves with a few classes of compounds found in essential oils we can begin to predict the therapeutic potential of various essential oils based on knowing the predominate chemical constituents that are present in the oil. When we talk about aromatic compounds found in essential oils, they are primarily made up of a class of compounds called terpenes. Terpenes are made up of isoprene units. Isoprene units are 5 carbon unsaturated molecules that form bonds together to make bigger molecules. This figure shows how two isoprene units form a bond to become a bigger molecule. The simplest terpene molecule is called monoterpenes. Monoterpenes are 10 carbon atom molecules made of two isoprene units. 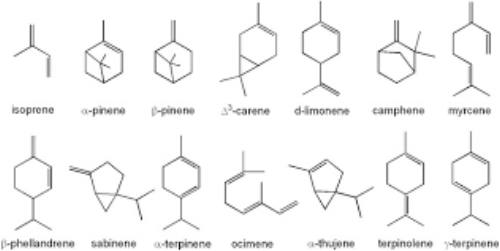 Examples of common monoterpenes found in essential oils. One of the most prevalent monoterpenes found in citrus oils is limonene. Limonene has many well researched and scientifically substantiated therapeutic properties such as activates white blood cells, analgesic, antibacterial, antihypotensive, anti-inflammatory, antinociceptive, antiobesity, antioxidant, antitumoral, antiulcerogenic, anxiolytic, hepatoprotective, immunostimulant, skin penetration enhancer, vasorelaxant. Limonene is responsible for the characteristic citrus aroma and the uplifting and energizing effects on the mood when breathed in. Limonene is responsible for the citrus aroma we smell. Over the next few days, I am going to be sharing chemical information about some of my favorite essential oils. I will choose an oil and share about the main chemical components in the oil, and we will discuss what the research says about the therapeutic benefits of each component. Do you have a favorite essential oil you want me to cover? Please post it in the comments along with your IG handle, and I will post chemical information and tag you in the post. Be sure to follow our IG accounts @essentialyogaspace @happyhippyme to continue to receive essential oil education and health tips. Essential Yoga Space is located inside of 626 Fitness, LLC.